We were recently mentioned in the 2013 Annual Report for our Rock the Vote Campaign. It means a lot to us that our efforts are not only recognized, but also felt by the entire SUNY Oswego community. Here’s the what our administration had to say about student involvement, engagement, and collaboration between organizations. It’s been nearly two years since our campaign, but we are still thankful for all of the organizations who played a huge role in making Rock the Vote at SUNY Oswego the success that it was. For the full annual report, click here. “From strengthening democracy to advancing health and safety, from developing new educational tools to aiding disaster stricken families, members of our college community played constructive roles in the wider world in 2012-13. As the academic year began, the 2012 election was on the horizon and the college‘s Civic Engagement Coalition coordinated its first comprehensive voter registration and education campaign. Film and discussion series, a debate and other events built engagement with the democratic process and registered more than 1,300 voters. The project culminated in an election night party in the Campus Center as returns rolled in. Some 70 students representing student media WTOP-TV, WNYO-FM and the Oswegonian covered election night like never before, filling four hours of live air with remote broadcasts, roundtable discussion and constant updates via social media, providing Oswego County‘s only TV coverage and streaming it online. “There‘s nothing ‘student’ or ‘pretend’ or ‘practice’ about what we just did,” WTOP-TV station manager Ben Gordon said with pride as the marathon telecast wound down. SUNY Oswego was named to the 2013 President‘s Higher Education Community Service Honor Roll with Distinction for the third consecutive year. Oswego was one of under a hundred institutions to achieve the national designation. Highlighted were the college‘s Mentor-Scholar Program, Alternative Break volunteer program and disaster relief projects. I want to first thank the panel, for they were the ones taking time out of their day to educate the students, who I would also like to thank. Without student interest, this event would not have been possible. Your drive to learn more about our community and the governing bodies involved which keep us safe is an important part of building a positive environment for everyone. Finally, I want to thank the organizations who play even a minor role in making this a successful event. The Political Science and Public Justice clubs, Student Association, The Oswegonian, WTOP, the Public Justice, Political Science, and Communication departments, The Compass, Phi Sigma Sigma, Students For Global Change, The Office of Business and Community Relations, The Public Relations Office, The Point and Student Involvement, and WRVO. The event was everything we planned and more. We were happy to see students asking important questions during the event, voicing concerns. But, the best part was watching students interact with the panel members after the event was over. 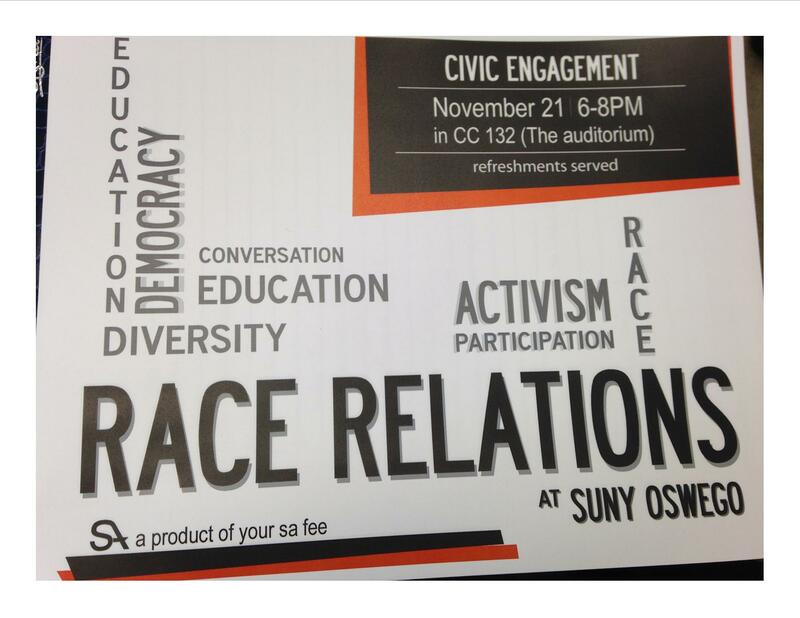 For pictures from last night check back here or on our Facebook page (facebook.com/sunyoswegocivicengagement) in the next couple of days. We hope to keep the ball rolling with more events and collaborative efforts to educate everyone in the near future, so stay tuned! Have an idea for an event or want to collaborate? Email us at Civic@oswego.edu. We would love to hear from you.